In order to make sense of our surroundings, we, as humans, constantly group things into discrete catagories--states of matter, times of day, types of clothes, etc. Since Linnaeus, we have consistantly grouped life in boxes-within-boxes, based on physical characteristics. The advent of nucleic acid sequencing changed some of these early notions of taxonomy. But now, as we discover more about life, specifically of our microbial counterparts and their viruses, we are coming to the realization that Linnaein taxonomy is not sufficient. Especially if our motivation for using taxonomy is to deduce evolutionary relationships. Viral taxonomy has some very specific shortfalls. Researchers in this 2002 Journal of Bacteriology article, lay out these shortcomings. 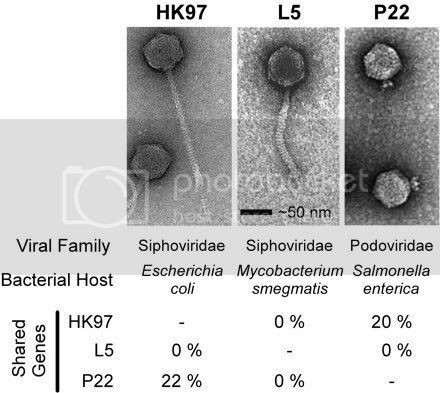 One striking point is that with viruses, structure alone is not sufficient to characterize a phage into species. The figure here shows two similar looking phages with very different DNA sequence. This concept could easily be applied to a variety of other viruses. Another problem, is that species is defined as organisms that share a common gene pool. Viruses are constantly moving genetic information into and out of hosts. Many viruses have the ability to cross-infect more than one host as well. This means that the gene pool available to an organism crosses most borders of what we traditionally define as species. The muddle within genetic taxonomy is getting a recent look. The discovery of MIcrobe MImic Virus (Mimivirus) is a startling look at how complex this tangled web is. A recent article in Nature Microbiology, discusses not only the question of taxonomy, but challanges our definition of life. Their definition presupposes that viruses are more complex than merely "parasitic nucelic acids." They propose that the presence of either a capsid or ribosomes be the primary classification system for life and that genomic contents completely define an organism. The proposal consists of defining capsid-encoding organisms (the viruses), ribosome-encoding organisms (eukarya, prokarya, and archea), and "orphan replicons" (plasmids and viroids). Whether or not this classification scheme will take root remains to be seen. There will certainly be critics, however, I think that the evidence available strongly supports the classification of viruses as a segment of life.